Need Help Identifying and troubleshooting your 4wd? You’ve came to the right place! The 4wd system on your Yamaha ATV or Side by Side is operated by a push button switch that sends power to a relay, which in turn sends power to the servo motor, which engages your 2wd, 4wd, and difflock. 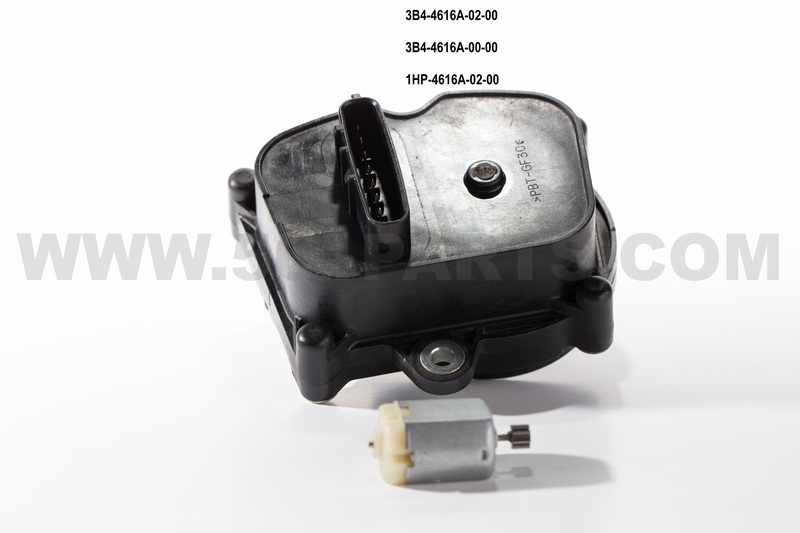 Push button switch– Located on the handlebars on ATVs and the dash inside the cab on SxS’s. It let’s you switch from 2wd, 4wd, difflock with the push of a button. Relays– There are three relays that are responsible for the 4wd operation. On non diff lock models there are two. On ATV’s they’re located either under the seat next to your fusebox or under the front rack near the battery. On SxS’s, they’re located under the front hood in the battery box. If either of these are faulty it can cause problems so always check each one. 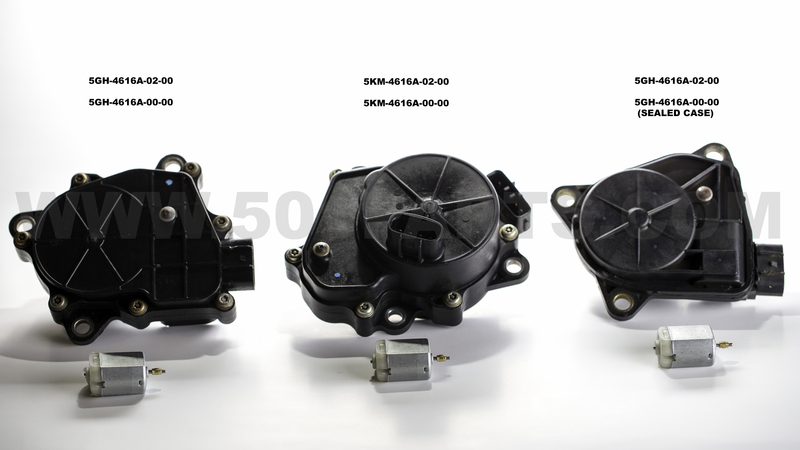 Servo Assembly– The servo assembly is the black plastic assembly that’s mounted on the rear or side of your front differential. The servo “motor” (as shown in the pictures) is housed inside the black plastic assembly. This motor is usually the culprit for most 4wd related problems. While we do have complete servo assemblies available, there is no need to replace the entire assembly unless, A. you have somehow busted the black housing, B. the contacts are burnt inside the housing. 99% of the time, you can remove and open the servo assembly (as shown in the videos) and return your assembly to new condition by replacing the motor only. There are four different types of servo assemblies. See the pictures below to identify which one is yours. If you’ve purchased a servo motor and need help installing it, you can either watch our video titled replacing the servo motor, or you can print out the instructions below. Problem 1 – 4wd not engaging, and when the push button is pressed nothing happens. Step 2– Tap on the relays, one could be stuck (Two black with G8HN# on top and one white relay on most models.) Also check the connections on the servo and relays to make sure they’re connected properly. If it tests good, proceed to next step. If they test bad, you can find a replacement here. If they test good, proceed to the next step. For a switch that tests bad, you could try cleaning it before buying one. See video. If it tests bad after cleaning or you just want a new one, you can find it here. If it tests good, proceed to the next step. Step 6– At this point you are certain your servo, relays, and switch are good. Next, you’ll want to start tracing wires looking for anything that’s frayed or broken. Common places for problems are under the fusebox on SxS’s, under the front racks on the ATV’s. Also check the connections under the relays beneath the seat on the ATV’s. You may have to untape and untie your wires to get to the problem. If you’ve tried all of this and still can’t get it going, you are welcome to call me at 501-658-0219 and I’ll help you through it. Problem 2 – I have replaced my servo motor or cleaned my servo assembly but now I’ve gotten it out of time and it’s not working properly. Step 1– One thing that will make life easier is to make sure not to bolt the servo up to the diff before you know for certain it’s working. You can plug the servo in and just let it hang to verify proper operation. You need to have three things synced to 2wd before plugging the servo in. 1. You should have the slide gear inside the diff to 2wd mode. 2wd is to the left if you’re sitting on the seat or to the front of the bike for those that go back and forth instead of left and right. On the Rhinos, move the slide gear to the right for 2wd if you are sitting in the seat. 2. Next, have the button in 2wd. 3. Finally, have the servo itself timed to 2wd. Here are videos on cleaning and timing the servo. Problem 3 – My ATV or SXS goes into 4wd or diff lock but will not come back out. Step 1– Try tapping on or swapping your two black relays and see what happens (if something changes then one is bad) proceed to test the relays to determine which one. You will break the clips off removing them. Almost no way around it. Problem 4 – My relays just click when I try and go in 4wd but I don’t hear the servo working. Step 1– Ensure the connection on the servo is tight and connected properly. If it is proceed to next step. While you are inside the diff, ensure the slide gear can be moved back and forth with your finger with ease. You may have to roll it a little to get it to move but should move freely. If it does not move freely, you can remove the allen screw cap and then remove the slide rod and gear with an allen wrench. The gear, rod and fork will come out. You can clean the slide rod up with emery cloth or light grit sandpaper. Problem 5 – The slider on my 4wd push button is stuck and will not go left and right with ease. Step 1- Watch this video. It will show you how to disassemble and repair the slider. Problem 6 – I have a big ride tomorrow and I can’t get the 4wd to work. How do I manually put my ride in 4wd and just leave it until I can troubleshoot it? Despite what mode you may be stuck in 2wd,4wd, diff lock. You can manually put the diff into whatever mode you like. If I were going to pick a mode to leave the diff in for a ride, it would be 4wd. Step 1- Remove the servo from the front diff. You’ll see a slide gear inside the diff that moves left and right. Simply move that slide gear to the middle for 4wd. If you want to stay in 2wd, move it to the left for ATV’s and to the right for Rhino’s. Verify 2wd by jacking up the front wheels. Step 2- Reinstall the servo on the diff being careful not to move the slide gear from where you left it. Enjoy your ride and return to this troubleshooting page when you return to fix your problem. Problem 7 – My 4wd engages off and on without pressing the button. If your 4wd is going in and out without pressing the button, it is something that you can fix fairly easy. This is actually a common problem with the 12-15 models. Most of the time, the problem boils down to an intermittent connection. After dealing with this on several occasions, I have found a few things that will fix the issue. Step 1- Pull the plug off of your servo that’s on the front diff and put a dab of dielectric grease on the contacts and plug it back in. Ensure the connection is tight. Do the same thing to your plug coming from the 4wd switch. This usually fixes the problem. It also doesn’t hurt to apply dielectric grease to the 4wd relays while you’re at it. If you’re still having the problem, proceed to step 2. Step 2- If you’re still having problems after doing the previous step, remove the switch, clean the contacts inside and reassemble. You can see a video here on how to do so. If you are still having problems after doing this, you could possibly have a broken or shorted wire somewhere between the switch, relays, and servo. Give the wiring a good once over inspection and see if you can see any obvious problems. Let us know if we can help you further. Here are two basic videos on how-to replace the servo motor inside the case. Last edited by oleblue22; 10-25-2015 at 08:07 AM. This is a consolidated Relay testing video that covers all models and years. We've added a few new videos. Still out here fellows, let us know if we can help you. We've added a few more videos to our troubleshooting page and we have all the parts and help you need for repairing your 4wd system.